Students in Sarah Sawyer’s Writers’ Workshop English class have good taste in literature. 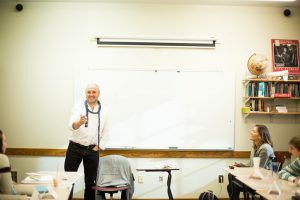 When acclaimed Irish-born writer Colum McCann visited last week, he asked them to name their favorite books. They listed an impressive array of titles, from J.D. Salinger’s Franny and Zooey to F. Scott Fitzgerald’s The Great Gatsby; from Sherman Alexie’s Flight to Homer’s Odyssey. Celebrating its 20th year, the Writers’ Workshop Series continues with a slate of authors who write in a variety of genres. Our first visitor to campus will be Madeleine Blais P’00, ’04, one of the founders of the series, and a Pulitzer-Prize-winning journalist and University of Massachusetts professor. 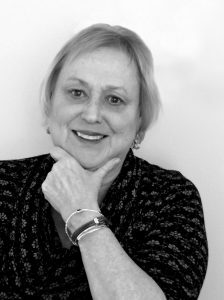 She is the author of “The Heart is an Instrument,” a collection of journalism, and “In These Girls, Hope is a Muscle,” chosen as a finalist in the category of general nonfiction by the National Book Critics’ Circle and cited by ESPN as one of the top 100 sports books of the 20th century. Her essays have been widely published. She joins us on Oct. 16 at 7 p.m. in the Dodge Room of the Reed Campus Center. Arriving on campus on Nov. 6, Timothy Donnelly is the author of two books of poetry, “Twenty-seven Props for a Production of Eine Lebenszeit,” and “The Cloud Corporation.” Donnelly’s poems have been published in anthologies such as “Joyful Noise: An Anthology of American Spiritual Poetry,” as well as magazines and journals including Harper’s, jubilat, The Nation, and The Paris Review. Donnelly is an assistant professor and director of undergraduate creative writing at Columbia University. He is also the poetry editor for Boston Review. His talk will be held at 7 p.m. in the Grubbs Gallery of the Reed Campus Center. 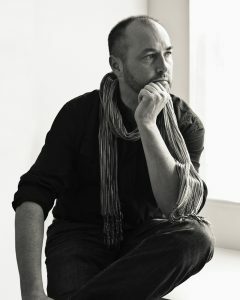 Colum McCann is the author of six novels and three collections of stories. Born and raised in Dublin, he has been the recipient of many international honors, including the National Book Award for “Let the Great World Spin,” and an Oscar nomination. His work has been published in more than 35 languages. 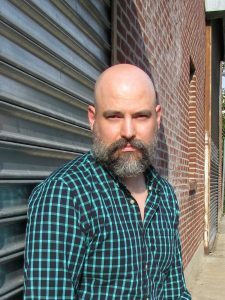 He is the cofounder of the nonprofit global story exchange organization Narrative 4, and he teaches in the MFA program at Hunter College. He will be on campus for two days, working with students and teaching classes, starting Nov. 10. He will not give a public appearance. After graduating from Spelman College, Nic Stone mentored teens and lived in Israel before returning to the U.S. to write full time. 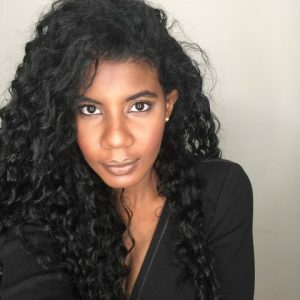 Having grown up among people with a wide range of cultures, religions, and backgrounds, Stone strives to bring these diverse voices and stories to her work. She is the author of the forthcoming Dear Martin (Crown Books for Young Readers), which received 4.62 stars out of five on Goodreads. Stone will present at 7 p.m. on Jan. 23 in the Dodge Room of Reed Campus Center. Dena Simmons had some hard-earned advice for teachers: consider the backstory of each student in your class. 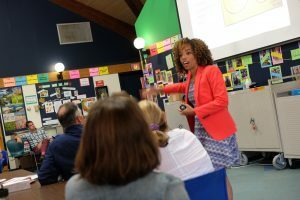 From her childhood in the Bronx, NY, to boarding school in Connecticut, to a successful career in higher education, Simmons, who leads the Yale Center for Emotional Intelligence, brought her personal narrative to a recent faculty meeting. She shared difficult boarding school memories: a teacher publicly correcting her diction; walking into a dorm room and seeing the resident guarding valuables in Simmons’ presence; and being asked, “Where are you from? No, where are you from from?” She said she didn’t fit in at school but eventually absorbed the cultural rules. 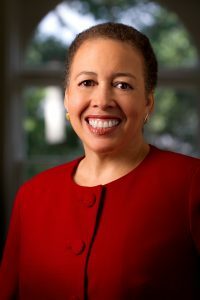 Williston Northampton School is proud to welcome Dr. Beverly Daniel Tatum—a researcher and author on race relations and a leader in higher education—to campus this fall for the school’s 177th Convocation. 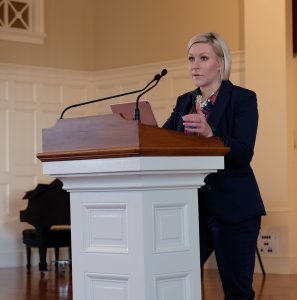 Tatum, a former Williston trustee and a parent of members of the classes of 2000 and 2004, will address the school community during an event on the Quadrangle on the evening of September 15. Class dinners follow the event.